Posted: Sun Feb 03, 2019 10:10 am Post subject: Wright / Schindler Furniture Stolen! The thieves seemed to know exactly what they were looking for. They entered an unmarked warehouse on a South Los Angeles side street, moved through a warren of file cabinets, yellowing papers and jettisoned desks, and breached a small storage room. 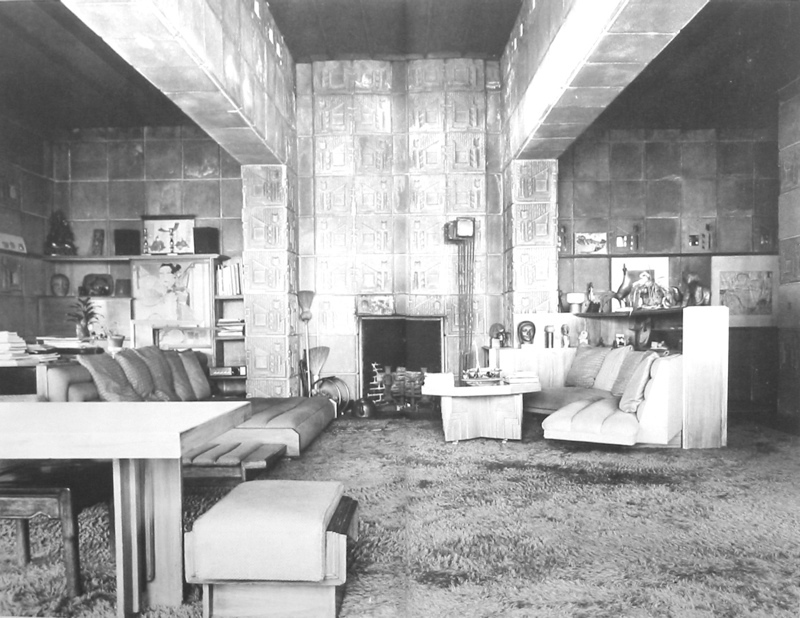 Inside was a cache of furniture designed by two of the most celebrated American architects of the 20th century, Frank Lloyd Wright and Rudolph Schindler. 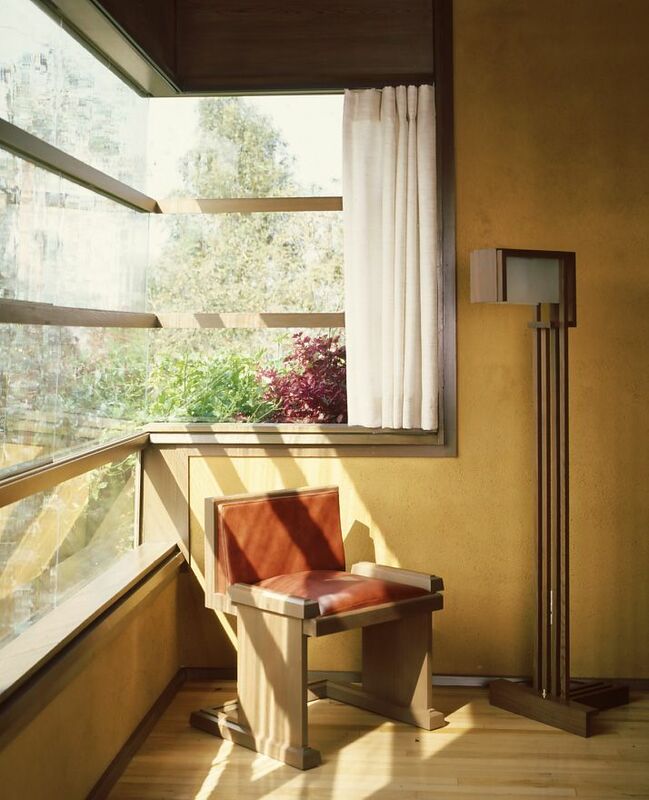 The thieves made off with two of Wright’s striking floor lamps and a cushioned chair believed to have been designed by Schindler — a haul with a potential value of hundreds of thousands of dollars. Six years after the heist at the USC warehouse, the identities of the perpetrators remain a mystery. There is a second puzzle: Why didn’t the university report the theft to police at the time or seek the public’s help in recovering the irreplaceable pieces? Detectives only learned of the larceny in recent weeks, after an anonymous letter to the Los Angeles Times revealed the crime. 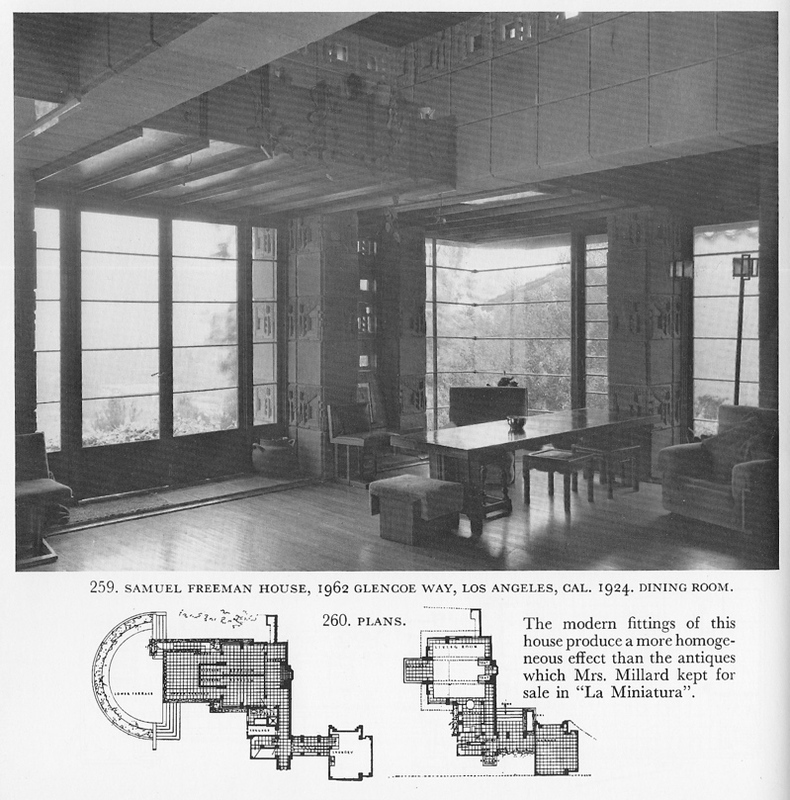 The architect, already famous and enjoying a midlife sojourn in California, ringed the living room with tall windows that provided dramatic views down Highland Avenue and of the surrounding hills. 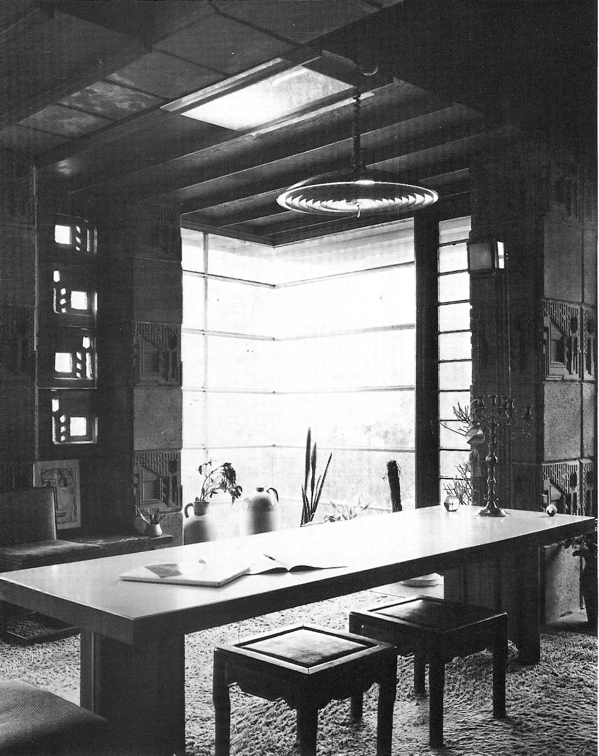 The furniture he fashioned for the room included the 6-foot-high cast iron and glass lamps. 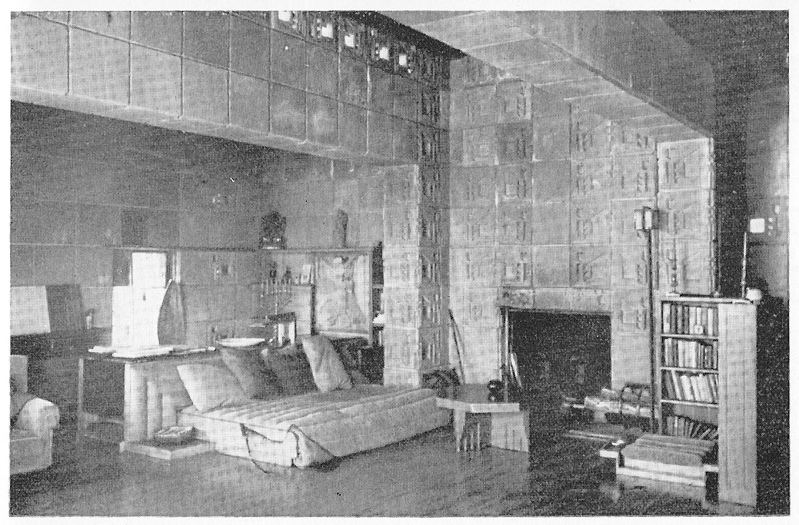 His protege, Schindler, later worked on the house, adding his own unique furnishings. For decades, the Freemans’ eclectic crowd of artists, scientists and leftists savored the home and its decor. “Casablanca” actor Claude Rains was a regular at the couple’s so-called salons, and Harriet Freeman feted legendary choreographer Martha Graham at a dinner party in the living room. Samuel Freeman died in the living room in 1981. Harriet suffered a stroke and spent her final months in a bed in the living room. She died in 1986. Childless, they left the home and furniture to USC, hoping the university would treasure the property as a site for meetings, classes and historic preservation. The Freeman House suffered severe structural damage in the 1994 Northridge earthquake. Tiles tumbled from the house and broke. It took the university years to secure more than $1 million in restoration funding from the Federal Emergency Management Agency and other sources. Around 2000, in advance of the work, USC moved the contents of the home, including the Wright and Schindler furniture, to the architecture school’s rented warehouse. The brick facility on 24th Street, formerly a city power station, has a cavernous interior with at least one separate, locked room. Some broken tiles were stored in the main room while the furniture was placed in the locked area, according to people familiar with the warehouse. For the next decade, the pieces that had delighted the Freemans and their guests would sit in the dark, glimpsed only occasionally by USC faculty, staff and students. There was no sign of a break-in or vandalism, and nothing but the Wright and Schindler furniture seemed to have been taken. Kenneth Breisch, an associate professor who oversaw the graduate program in historic preservation, said that as far as he knew, there was only one key to the room and it was maintained by the facilities department. The staffer who had discovered the missing items contacted Breisch to see whether he knew anything. Told no, the staffer said he planned to alert campus police, according to Breisch. In fact, the stolen floor lamps and chair had significant value. The lamps are particularly rare and coveted by collectors. A nearly identical piece Wright made in the same period for a Hollywood Boulevard residence sold at auction two years ago for $100,000. “Because these are so rare, I would say it’s a tremendous loss,” said Heinz, adding that Wright created about a dozen such lamps. Schindler’s chairs are also in demand. Last July, two of the architect’s redwood “sling” chairs were reported stolen from an Olympic Boulevard storage unit rented by the Friends of the Schindler House, the nonprofit that maintains the architect’s former West Hollywood residence. Board member Robert Sweeney told the police the chairs were original to the Kings Road landmark and estimated their value at $25,000 each. Despite the clear value of the items taken, no one at USC filed a report with campus police, LAPD or the university’s insurance carriers. Word of the theft circulated among some at the architecture school, but few, if any, outsiders were told. It remained a secret until last summer when someone’s conscience appeared to have been prodded by a listing at a Chicago auction. The listing described the lot for sale as a “textile block from the Samuel Freeman House, Los Angeles” and identified the seller as a private collector in Chicago. It was a 16-inch square, the size of the original Freeman blocks, and had discolorations indicating decades in the elements. It sold for $5,000 in June. Weeks after its sale, The Times received an anonymous email describing the warehouse theft. The author also included a link to the auction and wrote that even if the sale was not connected to the theft, it was troubling. How could the tile have fallen into private hands when its ownership had passed directly from the Freemans to USC, the writer asked. A search of campus police databases and inquiries to half a dozen employees turned up nothing about a theft, she said. But further investigation by USC’s Office of Professionalism and Ethics, a new unit set up after recent scandals, determined that the tip had merit. On Jan. 22, campus police filed a report with the LAPD, identifying the three missing items. The university blamed the 6½-year delay in contacting authorities on a miscommunication between employees, according to police. “It’s quite alarming, frankly, that there’s a gap,” said Lt. Perry Griffith of the Los Angeles Police Department’s Southwest station, who reviewed the report before handing it off to the department’s Art Theft Detail. In a statement, USC said it was fully cooperating with the police probe and pursuing its own internal investigation. LAPD Det. Don Hrycyk of the art theft unit said his investigation was at the preliminary stage. “There was no forced entry, so it looks like someone who had access to a key,” Hrycyk said. The passage of time had made dusting for fingerprints and other forensic techniques all but impossible. Memories have faded, and witnesses are out of reach. “A lot of these people are no longer at USC,” Hrycyk said. The tile auctioned in Chicago is not part of the LAPD investigation, he said. USC said it had “no verification” as to whether it was stolen from the house. Richard Wright, the president of the Chicago auction house, said the seller told him he obtained the piece several years ago from a dealer. Wright said he believed that the tile was originally from the Freeman House’s garage and that it was removed after the 1994 earthquake. It is situated on a narrow, winding street that dead ends on a cliff side and has little parking. To the rare visitor, the home’s disrepair is obvious, with splintered wooden beams, peeling paint and gaps in the cement-tiled walls. perhaps fitting to the subject. "Inside job" (my term) seems to fit the bill, here . . . ? illustration to the Times piece -- if the bench shown is the "chair" reported in the piece ? 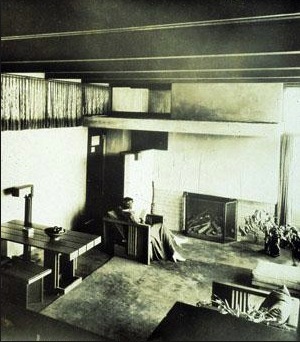 house; however, Schindler is said to have furnished two Freeman bedrooms in 1928. Perhaps Schindler provided chairs to go with his dining table ? Inside job? Why wouldn't the first theft be reported? By weird coincidence, if google searches would lead one to be a suspect I would be on it. I've been researching Schindler and Wright tables for inspiration for the dining table we are designing. Last Friday I had someone knock on the door mid afternoon on a freezing day, something that never happens. The person was not dressed for the weather, I brought him inside and he turned out be the owner of a Schindler House in LA who was in town to interview a possible presidential candidate. Although I was familiar with Schindler, I never spent much time researching his work. The polar vortex and following heavy snow had me homebound providing the perfect opportunity to research. 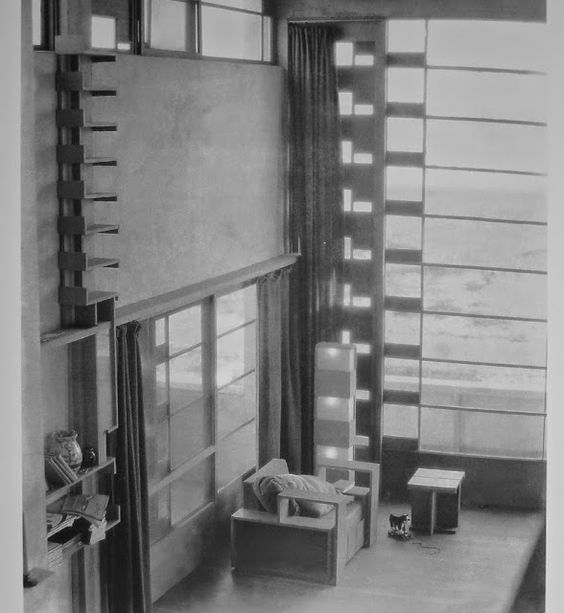 In research, I learned that Schindler designed a cubist floor lamp in 1926 (Lovell Health House). Was this several years before the Wright cubist lamp? Schindler'a sofa and sling chair are incredible. Enjoyed looking at his work and reading about the relationship between Schindler and Wright. Thanks, Mod mom. The Schindler Lovell residence is the beach house; the Lovell Health House is Neutra's. I'll look for images of Schindler light fixtures, which are particular favorites of mine, too . . .
For the USC theft not to be reported might suggest that the cover-up came from the source, and/or from the abettor(s), of the crime ? 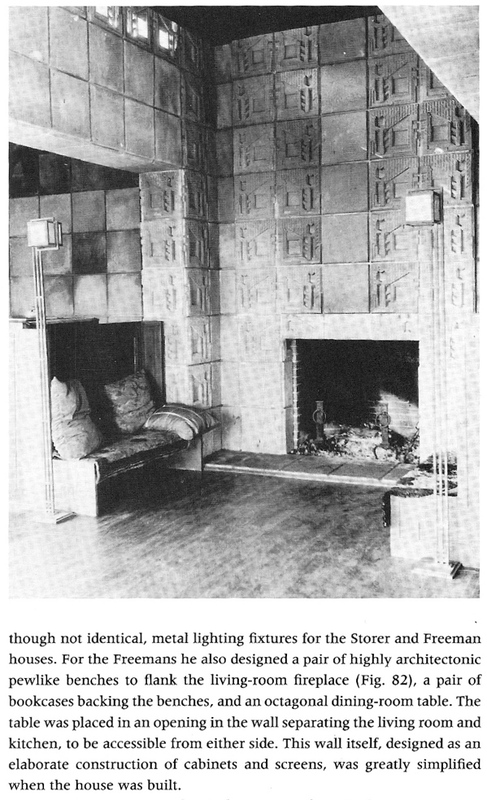 And here are four interior views of the house; I am not able to immediately date these photos, other than to say that the first two are from "In the Nature of Materials," 1941. Which Wright cubist lamp are you referring to? 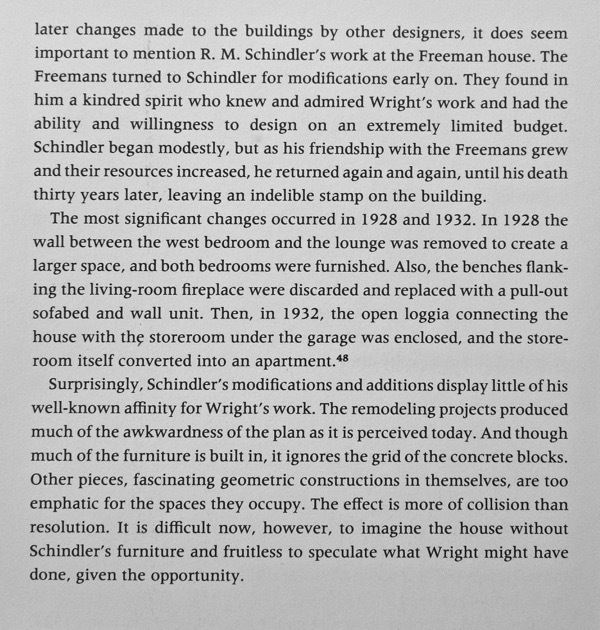 The Schindler floor lamp can be seen in several Wright houses, including the reproduction at Jacobs 1. I have to agree with one letter writer after the article...that this house should have been sold to a private party who would have restored it. Look at the state of the other block houses in private hands...and now look at Freeman. Granted Freeman may have more problems than the others in terms of foundation, but a private owner like a Joel Silver would have done a better job in caring for this house. Perhaps the best thing for the house now is to dismantle it...sell off all those blocks for $5000 each (as one apparently earned at auction)...and use the money to start rebuilding the structure with a better foundation and materials. Would a reproduction of a Wright house on its original site be a unique phenomenon ? My bad, SDR. The lamp is in the Lovell Beach House. Andrew Romano (owner of Schindler's Walker house 1922-26)) posted a lovely interior of Schindler's Lovell Beach House which shows 2 cubist lamps, one that is either resting on a book shelf or mounted on the wall below clerestory windows and the other on the floor near the window next to 2 Eames molded plywood chairs. I asked and Andrew told me the lamps were from 1926. I haven't seen the photo in my searches and he noted it was difficult to get into the house. He also noted that there is a documentary by @valentina.vision and a TV show by Josh Gorrell in the works. Not that lamp. Both (2 different lamps in the Lovell BeachHouse) are much more similar to the Wright cubist floor lamp I believe known as Taliesin2. Thanks, Mm. Where did Mr Romano post his photo ? Oh -- you're talking about the stacked lamp at Lovell ? Pretty cool, isn't it . . . ! He credits the photo to someone else but unfortunately my wifi is buggy and I can't access it. Interesting person to follow.